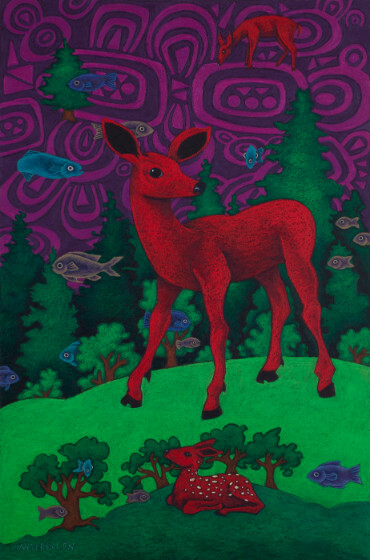 The imagery of Laurel Burch inspired me to experiment with my own colorful wildlife. I intentionally wanted large bright areas of color and focused on using the brightest reds available, applying them to contrast with the vibrant greens and the pink and purple pattern of the sky. This psychedelic background is based on the spirals carved in stone in Ireland at the megalithic passage grave, Newgrange (circa 3300-3200 BCE). Flying fish deserve to be everywhere! This first exploration of the deer theme is in colored pencil and oil pastel.